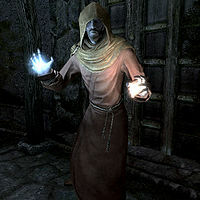 Erandur, once known as Casimir, is a Dunmer priest of Mara investigating the nightmares plaguing Dawnstar. While investigating, you will be directed to Erandur, who is also looking into the problem. This will start the quest Waking Nightmare. He wears a set of hooded monk robes with a pair of boots. He carries a leveled mace of the best possible quality and two leveled potions of healing. He also carries a torch, a belted tunic and the key to Nightcaller Temple. He relies on three spells, specifically Lesser Ward, Firebolt, and Flames though he also uses his mace. Erandur can be found in the taproom of Windpeak Inn, busily reassuring the town's residents to trust in Mara: "Everyone, please. I'm doing what I can to end these nightmares. In the meantime, all I ask is you remain strong and put your trust in Lady Mara." When asked what is wrong with everyone, he will tell you, "The entire town is being plagued by horrible nightmares. They're in serious danger but I'm afraid there's little I can do about it." 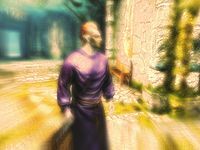 Inquiring further, he elaborates, "These dreams are manifestations created by the Daedric Lord Vaermina. She has an awful hunger for our memories. In return, she leaves behind nightmares, not unlike a cough marks a serious illness. I must end her terrible influence over these people before the damage becomes permanent." When asked about Vaermina, he will answer, "Vaermina resides in a strange realm known as Quagmire... a nightmarish land where reality shifts upon itself in seemingly impossible ways. From her citadel at the center, she reaches forth to collect our memories, leaving nothing in return apart from visions of horror and despair." He is unsure what she does with the memories, but is sure it cannot be good: "Who can say? Perhaps she collects them for display like works of art in a nonsensical art gallery. Whatever the case may be, her intentions are far from benevolent." If you ask how to solve the problem, he will say, "I need to return to the source of the problem, to Nightcaller Temple. Perhaps you'd be willing to assist me in that regard?" Asking why he said "return", he will say, "I've already said too much. If anyone overhears what we're saying, it could start a panic. I would simply ask that you trust me and help me end Dawnstar's nightmares." If you try to reject helping him, he will instead say, "I understand. If you should change your mind, I'll be here." If you decide to help him end the nightmares, he will be relived: "Mara be praised! Nightcaller Temple is only a short walk from Dawnstar. Come, we must hurry." While walking towards Nightcaller Temple, Erandur will talk about the temple and the priests who lived there: "The tower on that hill is our destination. People around here call it the Tower of the Dawn. I'm not familiar with the tower's history, but it was deserted for quite a long time before Nightcaller Temple was established inside. 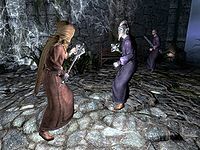 When the temple was active the priests would rarely be seen in Dawnstar. They preferred to live a solitary existence. The temple's been abandoned for decades now. Ironic isn't it... a ruin within a ruin? There's a small shrine to Mara I established inside the tower's entry hall. I was hoping to seek spiritual guidance from Her. Perhaps my prayers were answered and your reason for stumbling across Dawnstar is more than a mere coincidence. Follow me, it's this way. It feels good to finally have a chance to help these people. Helplessly watching them suffer's been difficult." Before entering, he will inform you of the dangers you are about to face: "Years ago, this temple was raided by an orc war party seeking revenge... they were being plagued by nightmares just like the people of Dawnstar." Asking if they were successful will make him continue: "No. Knowing they could never defeat the orcs, the priests of Vaermina released what they call "The Miasma," putting everyone to sleep." Asking what the Miasma does, he will explain, "The Miasma was created by the priests of Vaermina for their rituals. It's a gas that places the affected in a deep sleep. Because the rituals would last for months or even years, the Miasma was designed to slow down the aging process." When asked why sleep is so dangerous, he will respond, "I'm concerned that when this place is unsealed, the Miasma will dissipate and they'll awaken; both orcs and priests alike." When asked if the gas itself is dangerous, he will say, "Sadly, yes. The longer an individual is exposed to the Miasma, the more the mind can become damaged. Those who've been under the effect of it for extended periods of time have been known to lose their minds entirely. In some cases, a few never awoke at all." When you enter Nightcaller Temple Erandur will walk to the back of the room and cast a spell on the back wall: "Give me just a moment, and I'll have this open." Once inside, he will say, "Now I can show you the source of the nightmares. Over here." Looking down, you can see the Skull of Corruption glowing in the dark: "Behold the Skull of Corruption, the source of Dawnstar's woes. We must reach the inner sanctum and destroy it. Come, there's no time to lose." Asking how the Skull can affect Dawnstar will make him say, "Lore holds that the Skull of Corruption holds a constant hunger for the memories of others. The Skull has been out of touch for so long, I fear it's gained the ability to reach out on its own and try to feed. What it does with these memories is just conjecture and an argument for scholars and historians to this very day." When you reach a doorway blocked with a barrier, he will say, "Damn it. The priests must have activated this barrier when the Miasma was released." Saying that the barrier looks difficult to breach will make him respond, "Impossible actually. Hmm, I wonder... There may be a way to bypass the barrier, but I must check their library and confirm it can be done." At this point, if you point out that he seems to know an awful lot about the place, he will reveal his past: "I suppose there's no point in concealing the truth any longer. My knowledge of this temple comes from personal experience. I was a priest of Vaermina." He will then elaborate: "And what would you have me say? Sorry for following the misguided teachings of a mad Divine? Sorry for stealing memories from children? Do you realize when the orcs attacked, I was only concerned with myself? I fled... and left my brothers and sisters behind to die." Then, he reveals his reasons for becoming a Priest of Mara: "I've spent the last few decades living in regret and seeking redemption from Mara. And by Her Benevolence, I will right my wrongs." Once you are ready to continue, Erandur will say, "I still have my key to the library. Whenever you're ready, let's move on." Entering the library, Orcs and devotees begin to reawaken. Once they have been dealt with, Erandur will say, "Barring any more interruptions, perhaps we can locate the information I need." He will then explain what you're looking for, saying, "We're looking for a book of alchemical recipes called "The Dreamstride." The tome bears the likeness of Vaermina on the cover. It should be here somewhere." As you search for the book, he will comment, "This library used to be filled with arcane volumes. Now look at it; almost everything's been burned. I hope the tome we need is still intact." Once you have found the book, he will ask, "Let me take a look... Mara be praised! There is a way past the barrier to the inner sanctum. It involves a recipe for a liquid known as Vaermina's Torpor." When asked if it is a type of potion, he will respond, "Yes. The Torpor grants an ability the priests of Vaermina called "The Dreamstride"; using dreams to travel distances in the real world." If you remark that dream traveling is amazing, he will concur, "Quite amazing, yes. Alchemy and the blessings of a Divine distilled down into a ingestible liquid." If you instead claim that such is impossible, he will reassure you by saying, "I assure you, the Dreamstride is well known in Vaerminian Lore." Either option will have him end with, "Sadly, I have yet to see it function in person." He will then reveal, "As a sworn priest of Mara, the elixir won't work for me. The Torpor will only work for Priests of Vaermina, or the unaffiliated." Asking what The Dreamstride feels like, Erandur will reply, "You'll be viewing the memory of another through your own eyes and with your own body. Those around you will perceive you as normal and you will find the words you utter may not be your own. Thanks to all of these odd principles, there is quite a lot of debate as to whether this is really a dream or just the machinations of Vaermina." Asking about where the Torpor can be found, he will say, "I believe there is a laboratory in the east wing. If we proceed there, we should be able to locate a sample." Following Erandur to the laboratory, more Orcs and Devotees begin to awaken. Once you have fought your way past them, Erandur will say, "Now that they've been dealt with, we need to find the Torpor." When asking what it looks like, he will tell you, "It should be in a small bottle, very similar to a potion. I'll begin searching up here." Once you find the Torpor, he will say, "I'm relieved you discovered a bottle intact; this place looks as though it was ransacked by the orcs. So... I've taken us this far, but you need to guide us the rest of the way. Drink." He will urge you to drink the Torpor, quickly stating, "Dawnstar's fate rests in that tiny bottle. The longer we wait, the more damage Vaermina could be doing to those poor people. I understand your hesitation, but I promise you that it works." Asking how you will know when to wake up, he will respond, "I will watch over you as you slumber to ensure your safety. If I deduce anything is amiss, I will use my arts to bring you back. Otherwise, I am uncertain what will end your Dreamstride. Perhaps when Vaermina's curious appetite has been filled." When asked about possible dangers, he will reply, "I will not lie to you, there is some risk involved. The last time the Torpor was imbibed could have been decades ago. But I swear upon Lady Mara that I will do everything within my power to prevent any harm from befalling you." After drinking the Torpor, you will see what happened when the Orcs attacked Nightcaller Temple through the eyes of Erandur. Thorek: "The orcs have breached the inner sanctum, Brother Veren." Veren: "We must hold. We can't allow the Skull to fall into their hands." Thorek: "But... no more than a handful of us remain, brother." Veren: "Then we have no choice. The Miasma must be released." Thorek: "The Miasma? But, brother..."
Veren: "We have no alternative. It's the will of Vaermina. And what about you, Brother Casimir? Are you prepared to serve the will of Vaermina?" Casimir: "I've made my peace. I'm ready." Veren: "Then it's decided. Brother Casimir, you must activate the barrier and release the Miasma. Let nothing stop you. Brother Thorek, we must remain here and guard this Skull with our lives if necessary." Thorek: "Agreed. To the death." Veren: "Then let it be done. Farewell, my brothers!" Once you exit the dreamstride and deactivate the barrier, Erandur will be amazed: "It... it worked. Mara be praised! You vanished after drinking the Torpor and materialized on the other side. I have never seen anything quite like it." When you tell him about your experiences, he will say, "How I envy you. I can only imagine the excitement of seeing history through the eyes of another! Sadly, I am resigned to just reading of its wonders through my research of the Skull." As you walk trough the temple towards the Skull of Corruption, you meet Erandur's old friends Veren and Thorek. Erandur (Casimir): "Wait... Veren... Thorek... you're alive!" Veren: "No thanks to you, Casimir." Erandur (Casimir): "I no longer use that name. I'm Erandur, Priest of Mara." Veren: "You're a traitor. You left us to die and then ran before the Miasma took you." Erandur (Casimir): "No. I... I was scared. I wasn't ready to sleep." Veren: "Enough of your lies! I can't allow you to destroy the Skull, Priest of Mara." Erandur (Casimir): "Then you leave me no choice!" After defeating Veren and Thorek, Erandur will say "I... knew Veren and Thorek. They were my friends. Is this punishment for my past? Is it Mara's will to torment me so?" If you tell him they may be right and that we shouldn't destroy the staff, he will reply "No! You mustn't listen to them. They speak only lies and deception. Had we aided them in releasing the Skull, they would use it to wreak havoc across Skyrim. They... they had to die." He will then continue: "It's time. The Skull must be destroyed. If you'll stand back, I'll perform the ritual granted to me by Lady Mara." As he approaches the Skull of Corruption he will seek the help of Mara, chanting "I call upon you, Lady Mara! The Skull hungers. It yearns for memories and leaves nightmares in its wake. Grant me the power to break through this barrier and to send the Skull to the depths of Oblivion!" As he is calling for help from Mara, Vaermina will speak into your mind, trying to persuade you to kill Erandur before he destroys the Skull of Corruption. If you let Erandur live and destroy the Skull of Corruption, he will remark "Forgive me if I don't appear relieved... this temple has taken its toll on me." When approached again, he will reveal Nightcaller Temple to be his new home and offer his assistance as a follower as reward: "I'd constructed a meager shrine to Mara in the antechamber where we entered. My intention was to spend the rest of my years here, burying the past and praying for forgiveness. But instead, I wish to offer my services to you. If you ever wish to journey with me, I'll be here." Winterhold "The College of Winterhold is an amazing sight. I've never set foot on the grounds, but always wanted to." Karthwasten "The Forsworn haven't been kind to Karthwasten. I've heard rumors that they've attacked this place without mercy." The Pale "I grew up in The Pale. This land was my home for most of my life... and for a Dunmer, that's quite a statement, I assure you." Falkreath "We should bow our heads in silent reverence for those who are interred in Falkreath's cemetery." Temple of Mara "I've always wanted to make a pilgrimage here to the Temple of Mara. Thank you for bringing me here... you've made me quite happy." Markarth "Watch your step, Markarth has quite a reputation thanks to the Silver-Blood family. I wouldn't advise crossing them." Whiterun "What an amazing city. I've actually never managed to visit Whiterun, but I always wanted to." Windhelm "Windhelm is absolutely freezing. How can these people tolerate it?" Solitude "I was a student at the Bards College for a short time... until my affiliation with Vaermina was discovered. I haven't been back to Solitude since." Riften "I've heard Riften's home to the worst Skyrim has to offer. I hope we don't run into any trouble while we're here." Vampire Lair "Her Benevolence has taught me patience and mercy, but these vampires deserve none of it." "A good friend of mine was infected by a vampire long ago. He killed himself rather than change into one of those... things." "Vampires are utter abominations. We need to do everything in our power to destroy them." Warlock Lair "Being a priest of Vaermina put me very close to dark sorcery at its worst." "Let's try and stay together, the sorcerers in these places tend to... well, harvest bodies for parts." "I've seen my share of black magic, but that's all in the past now." Draugr Crypt "This place must be cleansed. These draugr were once living beings and they deserve better." "These poor souls... suffering in eternal servitude." "The thought of the dead rising... makes me sick to my stomach." Bandit Camp "Bandits know nothing of pity or mercy. No need to show them any either." 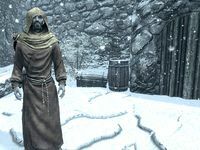 "A group of bandits descended on Dawnstar once... if it wasn't for the guard, who knows what they could have done to the place." "Bandits are the worst lot. They'd steal from their own mothers given the chance." Military Fort "I thought I heard footsteps. Be careful." 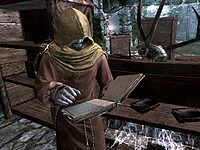 "When I was a young acolyte of Vaermina, I paid my dues in a shrine located within the catacombs of a fort in Cyrodiil." "I served as a healer in a fort not unlike this one long ago." Dwarven Ruin "I can't imagine what happened to the dwarves. How could a race with the capability to build a place like this simply vanish?" "I've never been inside a dwarven ruin. They are simply astounding." "Did you hear that? A metal on stone sound... hmmm, perhaps it was nothing." "This place could be massive... very easy to get lost. We have to be careful not to lose our way." Nordic Ruin "What a marvel of engineering. The ancient Nords were ingenious builders." "Watch yourself, these Nordic ruins are notorious for their traps." "These ruins are old, maybe a thousand years or more." Cave "Why anything would chose [sic] to reside down here is beyond me." "These caves... they harbor ill omens, I can sense it." "Trust in Mara... she'll protect us in this dark place." "I don't like the looks of this place... not at all." When nearing an object/room of significance "Impressive. Damn impressive." Anywhere "I don't know what persuaded you to assist me when we met in Dawnstar, but I'm glad you did." "I've done a lot of... questionable things in my life. Serving Vaermina was a horrible mistake, and I hope Mara will forgive me one day." "I was recruited as an acolyte of Vaermina as a young elf. I had no real childhood to speak of... we weren't permitted to socialize." "I've always felt a great deal of guilt running from Nightcaller Temple and leaving my friends to die. I'll never forgive myself for that." "After running from Nightcaller Temple, I wandered Skyrim for years until I was taken in by a priest of Mara who lived in Morthal." "Finding Mara was the greatest moment of my life. I'll never forget the warmth that spread through my heart when we embraced." "It was a bit difficult to come to the ways of Mara at first, but my fellow priests were kind and quite patient with me." "I've never admitted this before, but I've killed more than I care to admit. I'll just leave it at that." "My parents are long dead, but they lived wonderful lives... I have no sad stories to tell about them. Perhaps one day I'll visit their resting place." "I've been enjoying this journey with you. Not for the wealth we've accumulated, but just being [sic] carry Mara's will to every corner of Skyrim." "It's wonderful to be able to sleep soundly, don't you think?" The Skull of Corruption is part of the Oblivion Walker achievement. Allowing Erandur to destroy it will make you unable to achieve this, unless you obtain two Daedric Artifacts from the quest Ill Met By Moonlight. If you let Erandur live, he can be recruited as a follower and as a member of the Blades. 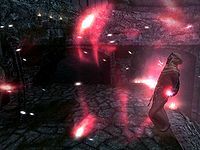 In combat, Erandur will use a mixture of melee weaponry and destruction magic. He is one of the few followers that will comment on the area you are in at the moment. Despite being a self-proclaimed priest of Mara, Erandur will still invoke Azura's name in combat dialogue like any other Dunmer. 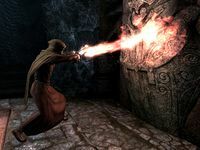 It is more likely leaving dialogue mentioning Azura out was an oversight during game development, as Erandur's demeanor when speaking of his devotion to Mara, as well as his mention of having set up a shrine to Mara in Nightcaller Temple, strongly implies he is telling the truth about his Divine conversion. Due to his robes taking up both his head and body slots, he will not equip body armor except when given a helmet or circlet, or if he is inducted to be a Blade. If you let Erandur enter the Nightcaller Temple first, he may not be at the entrance once you enter, but rather further inside the temple, a place you cannot get to without Erandur's help. This will as a result make the entire quest impossible to complete. To avoid this, just make sure to enter the temple before he does. This issue can be fixed by entering prid 00024280 into the console, followed by moveto player, which will bring him to your location. While following him up to Nightcaller Temple, Erandur may stop moving or walk back to the beginning of his route if he engages in combat, is jostled by running, or if you walk too far ahead of him. This can be fixed using the prid/moveto method described above. ? Clearing the area of enemies beforehand can help prevent this from occurring. If dismissed, he will return to Nightcaller Temple; however, if you wish to get him again as a follower, he may not reappear and seems to disappear from the game entirely. ? A good way to avoid this from happening is to dismiss him at the Temple. This page was last modified on 16 November 2018, at 00:05.